When I first started reading to books from upstairs at the Lockport Library, I found myself gravitating towards the books in the science-fiction genre. I tried them all, from sci-fi with some magic, to full-on magical fantasy, and hard science fiction. It was the masters, Clarke, Asimov, Heinlein, and Haldeman who captured most of my attention. Since then, I’ve tried to find today’s best writers of that particular brand of science fiction. With the popularity of the Harry Potter series and the Lord of the Rings movies, there has been a shift from the hard science fiction classics towards more fantasy. It has been harder to find some of those books that I really like. In my search, I’ve discovered Greg Bear, Gregory Benford, Kim Stanley Robinson, and Allen Steele. 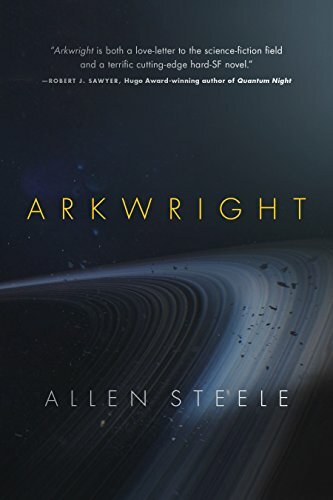 It is the last author who wins today’s review lottery with his newest novel, Arkwright. Nathan Arkwright is introduced as a cantankerous science fiction writer of the twentieth century, an author who was contemporary with the original greats that I mentioned at the beginning of this review. Using the fortune he had amassed through writing a series of books, he and his closest friends form a foundation with one goal in mind. They are looking for another planet to colonize before Earth was too far gone to save. The novel begins as Nathan is dying, but we learn his backstory through a series of flashbacks as his life is explained to his granddaughter. From that point, we get snippets of each generation of the Arkwright family as they move towards their goal of colonizing another planet light years away. Unlike some books, there is not a magical, unrealistic timeframe built into the story in order to move into the “exciting” part of the narrative. This moves along in generations of the family with each of those generations focusing on their part of the project. The ending of the book, when the goal of colonizing the new Earth is finally complete, definitely has a different feeling than the rest of the book. In some of the other reviews that I read, many people complained about this, saying it was awkward. I respectfully disagree. The ending of the book is on a strange, new world. It may be Earth-like, but it is definitely foreign. Of course it’s going to have a different feeling. Allen Steele wrote a generational science fiction story that transcends simply being a science-fiction story. While all the science is going on throughout the story, it is also a social commentary. Each generation of the Arkwright family has a mindset that conflicts with the previous generation. Each of these struggles must be overcome before they can move forward, both as a person and as a member of the Arkwright Foundation. There are moments that the success of the mission rests on a single decision by family members. In the midst of the struggles by the Arkwrights, public perception wavers on their mission. This causes additional conflict within the family, and nearly destroys the mission with zealotry. All these elements intertwine to make a sweeping tale of love, honor, and exploration. It also gives the reader a sense of hope. Even through all the trials and tribulations of life, success is still there if you’re willing to fight for it. I’ve read many other books by Allen Steele. When I saw this book on the New Release shelf at the library, I immediately took it home with me. I read it in two nights, turning the pages as quickly as I could read them, and reliving those days when I first discovered science fiction novels. It was a welcome piece of nostalgia for me. I can’t wait to find another like it. Arkwright by Allen Steele is a wonderful book waiting for the next person to grab it and give it a page turning whirl. Craig Bacon once tried to write a classic piece of science fiction, but his writing partners made it not so classic. It’s only fair after Craig ruined Christmas.